Tartans, most properly, are symmetrical plaids usually associated with Scotland or Scottish items. 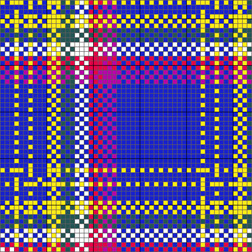 In fact, to be a tartan the plaid must be registered in the Official Tartan Registry. There are tartans not only for clans (Scottish families), military units, bands, colleges and universities, companies, clubs, cities, states, and even countries. Most correctly, you wear the plaids associated with you. So if you lived in the Yukon and were Irish, you could wear both the Texas Bluebonnet plaid, and the Irish plaid. How are tartan plaids constructed? They are made from a particular sequence of stripes of various widths and colors woven in a regular pattern in both directions. This sequence is called a sett. Because the same sequence is used in both directions, the plaid is symmetrical. You can always tell a symmetrical plaid because the blocks of solid color are always square. I always used to associate tartans with a fairly narrow range of pure colors. 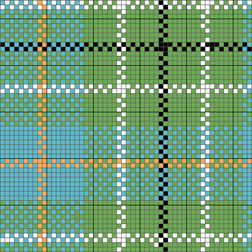 While this tends to be true of many tartans, they doe cover a pretty wide range of colors. What distinguishes tartan colors is that they are either fully saturated or muted heather colors; pastels aren’t used in tartans. There are also specific types of tartans you might see. Ancient tartans often have simpler setts and are in the muted colors associated with natural dyes. In fact, these tartans mostly aren’t ancient at all but Victorian, part of their craze for all things Scottish. Hunting tartans usually have greens, grays and browns predominating in the colors, so they will blend into the landscape. Dress tartans are often more complex or different colored versions worn for special occasions. Let’s analyze the simplest plaid of all, Rob Roy, to see how it’s constructed. Rob Roy is made up of equal stripes in red and black. We’ll make ours 4 threads wide. The left diagram shows the horizontal stripes as they would be stitched. The right diagram shows the vertical stripes. Put them together, as in the diagram above and you have the checker of Rob Roy, also sometimes called the Lumberjack plaid. One last note, if you do research on tartans you may find many different tartans for a single clan. Some are distinguished by geography, for example the Perrys of California might have a different tartan than the Perrys of Virginia. Some are distinguished by purpose, for example the Stewarts have ancient, dress, and royal versions of their familiar tartan. With others I haven’t been able to find a distinguishing characteristic. In any case, plaids remain a popular type of design appearing on everything from school uniforms to keyrings. They are also incredibly easy to make into needlepoint. Previous Post: What Is a Birthday Plaid?